in a specially selected T.T.O.® quality. This means Terpinen-4-ol content: min. 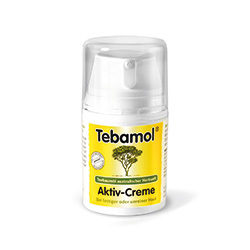 40%, Cineol content: around 3%. Suitable for the mild cleaning of skin prone to blemishes thanks to its genuine tea tree oil content with properties that protect against bacteria. Extracts of Hamamelis virginiana and Melissa officinalis have a skin-tightening, anti-inflammatory, soothing and calming effect and protect the skin. 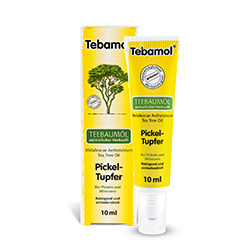 Directions for use: Apply with a cotton-wool ball, then use Tebamol® Active Cream. Special cream for oily and blemished skin. 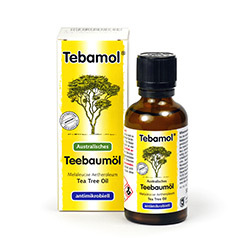 Tea Tree Oil (Melaleuca aetheroleum) gained from the leaves and tips of the Tea Tree of the species Melaleuca alternifolia (from the terpinen 4-ol type) as well as the additional complex of the active ingredients ribwort, mahonia and salicylic acid provide special care for impure skin and helps to prevent the formation of new skin impurities. The body lotion can be spread very easily over the skin, absorbs quickly and provides the skin with valuable moisture. It is suitable for all skin types. Almond oil cares for the skin and makes it soft and smooth. 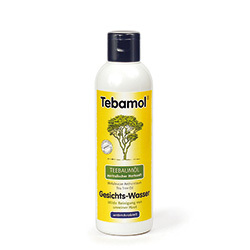 An extract of the desert plant Imperata cylindrica provides a long lasting and moisturising effect. Directions for use: Apply to the skin after taking a shower or bath. 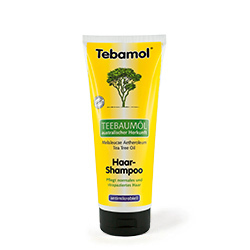 Contains genuine tea tree oil and D-Panthenol and prevents diseases of the scalp caused by bacteria. The condition of damaged hair is improved and the hair is both shiny and easy to comb. Directions for use: Wet the hair well, work up a lather, leave it on for a short time and rinse carefully. The hair tonic invigorates the scalp and helps to prevent excessive sebum production and dandruff. Directions for use: Apply the hair tonic to damp hair and massage in well with the finger tips. With a refreshing citrus and tea tree fragrance, particularly recommended for after sunbathing, sport and saunas. Directions for use: For cleansing the body when taking a shower. Cleanses blemished skin, promotes the regeneration of cells and helps to prevent skin impurities, such as pimples and blackheads, caused by bacteria. With natural Lavendula angustifolia oil. Directions for use: If required, apply several times a day to the affected parts of the skin. 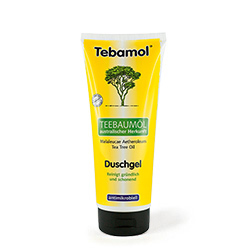 Contains a particularly high content of genuine tea tree oil with its refreshing properties. 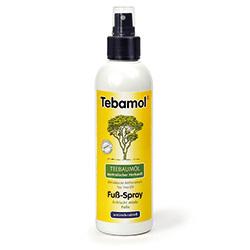 For use as a deodorant for foot perspi­ration and foot odour. Cleanses and cares for the skin on the feet and protects against athlete's foot at the same time. Directions for use: spray the skin on the feet twice a day and the inside of shoes twice a week.